There are close to 4,000 known species of frogs, including toads. They range in size from less than half an inch to nearly a foot long and come in a rainbow of colors and patterns. Adult frogs are carnivorous and will eat just about anything smaller than themselves, including insects, worms and even other frogs. A frog’s long, sticky tongue is attached in the front of its mouth, and, as a signature move, a frog can flick its tongue out to capture its prey with remarkable speed. The earliest known frog (Vieraella herbsti) appeared during the late Jurassic period, about 190 million years ago. The specimens that have been found in Arizona shows that the skeletal shape and body plan of the frog has remained almost unchanged. The biggest frog is the appropriately named Goliath frog (Conraua goliath) of Cameroon. They reach nearly 30cm (a foot) and weigh as much as 3,3 kilograms (7 lb). The smallest frog is the Gold frog (Psyllophryne Didactyla) of Brazil. They grow to only 9,8 mm (3/8 inch). Equally small is the Eleutherodactylus iberia discovered only in 1996 in Monte Iberia, Cuba. (It doesn’t even have a common name yet.) Other small frogs are poison frogs. They measure less than 1cm (1/2 inch). Recently scientists have noticed a marked decline in the numbers of frogs and other amphibians around the world. Some species are believed to have become extinct within the past fifty years. Causes for the decline include ozone depletion, pollution, habitat loss, introduction of new predators, disease and even a fungus. 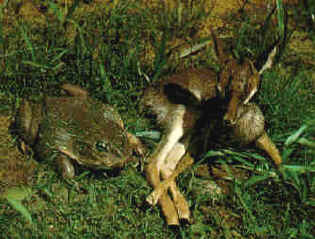 that’s a Goliath frog next to a baby deer! Frogs come in many shapes and colours all over the world – except Antartica! The large Cane toad, also called “Marine toad” or “Giant toad,” range in size from 15-23 cm (6-9 inches), but may get bigger. This tiny poison frog measures less than 1 cm (1/2 inch). The Gold frog from Brazilia, the smallest frog at 3/8 inch. Discovered only 1996 in Cuba, the Eleutherodactylus iberia also grows to only 3/8 inch.